A judge must decide whether the accused is guilty or not. Must a historian decide whether Jesus existed or not ? Or can a historian live with uncertainty ? Shouldn’t the historian emphasise the uncertainty, rather than guess at a verdict ? This is a serious problem. On the issue whether there was a historical Jesus or not, we see that some historians arrive at a judgement. They in fact eliminate the uncertainty that they had exposed before. They behave like judges, which isn’t their role. There is a difference between people trained in alpha or beta educations. See C.P. Snow and the clash of two cultures, between those who read Shakespeare and those who read quantum mechanics. My background is econometrics, say gamma. With people in law and history, economists e.g. can use the method of Verstehen, like introspection. With the physicists, we econometrians use hard mathematics and statistics. A tantalising question is whether gamma could be accepted as a bridge between alpha and beta. Let us look at a judgment. The Dutch legal system originally condemned Lucia de B. as a serial killing nurse. She claimed to be innocent but spent almost seven years in prison and suffered a disabling stroke because of severe trauma, before she was released after much a-do. The key role was for docter of medicine Metta de Noo – Derksen and her brother and philosopher of science Ton Derksen who exposed errors in the evidence and the trial. A key supporting role (supporting but still key) was for econometrician Aart de Vos and statisticians like Richard Gill of Leiden who explained that the court had been advised by crummy experts on statistics. My own paper may be found here. Let us compare this with the “historical method“. Historians not only reason like judges but they may feel that they must expound a verdict too, and thus they can be wrong on two counts. Note that this weblog uses wikipedia not as evidence but as a portal to look for the original scientific sources. The historical method gives an algorithm that Sherlock Holmes might use to perform his forensic art. That the dog didn’t bark is evidence too. Fine. This isn’t as complicated as econometrics. At the end of the wikipedia article we see some simple statistics. Now this is interesting. I encountered a historian who implied that I didn’t understand the historical method. When I look at the historical method, I encounter statistics again, that is part of my training. Don’t historians know this ? Don’t they know that econometrics is an empirical science ? I met another historian who apparently cannot live with uncertainty, and feels the need to expound a verdict. Anton van Hooff concludes that there is a historical Jesus. This is curious. He behaves as a judge, while a scientist would explain the uncertainty of the data. See this earlier weblog entry on this curious situation. My suggestion is a sieve of realism. Most evidence points to the likelihood that Jesus never existed but was created as a mythical figure to flesh out the gospels. Thus there simply cannot exist any evidence that he ever existed. Thus, if a historian claims that there was a historical Jesus, and comes up with a piece of evidence, then he or she should also look for alternative explanations that destroy that evidence. Clear evidence would only surface if there are no alternatives. For example, when Tacitus mentions the crucifixion by Pontius Pilatus he might merely use the statements by the christians themselves. There is no proof that he used another source, whence the evidence evaporates. Up to now, these historians don’t work like this. They behave like judges but in fact they conceal the uncertainty. PM. In that wikipedia article (retrieved today): “McCullagh sums up, “if the scope and strength of an explanation are very great, so that it explains a large number and variety of facts, many more than any competing explanation, then it is likely to be true.”” This is right, but the error is to decide from “likely to be true” to “true”. There still is uncertainty, so keep it there. Indeed the article continues with “(1) In thousands of cases, the letters V.S.L.M. appearing at the end of a Latin inscription on a tombstone stand for Votum Solvit Libens Merito. (2) From all appearances the letters V.S.L.M. are on this tombstone at the end of a Latin inscription. (3) Therefore these letters on this tombstone stand for Votum Solvit Libens Merito.” (willingly and deservedly fulfilled his vow) Now, what is the evidence for point (1) ? You only have the letters and no statement on paper afixed to the stone what they stand for. Or is it indeed true that there are thousands of such cases ? Or is the statement meant to express that such stones are found on cemetaries ? If we grant (2), the error in (3) is that the historian switches from probability to certain truth. Perhaps it was Victor Simplissimus who expressed his love for Lucia M.
Van der Boom’s case is that the Dutch including the Jewish inhabitants had heard the statements about the extermination of the Jews, even in a broadcast in 1942 by Queen Wilhelmina, but didn’t know what to think of it. Van der Boom concludes that they didn’t really know. He for example points to Anne Frank who apparently mentioned that she has heard about gas chambers but who at another point is furious about the maltreatment of Jews in Poland, as if the latter is worse than the former, or as if the gas chambers are only a rumour and not reality. Van der Boom confuses knowledge and certainty. As I expained in that earlier entry, the proper issue is cognitive dissonance. I am tempted to print the email that I sent him with my comment while linking to the earlier entry. But it is Dutch and may stop the flow of the argument. Van der Boom’s new presentation in the video neglects my comment and is a continuation of his error. This is disingenious. He also uses the Jews as his prime example. The image that we can agree on is that they sat as rabbits looking at the bright light coming towards them. This is effective rhetorics. It now becomes their own fault. But this is the wrong proposition. You cannot use victims as the prime evidence since people who are hunted down are less able to think clearly. You should focus on the main population that had more time to think. If their beloved Queen spoke about the extermination of the Jews, why did the Dutch not use this piece of knowledge to research this further and turn it into certain knowledge ? This is the proper accusation, and it sticks. The Dutch of 1939-1945 were disingenious and wrong, and their new hero is Bart van der Boom. My book The simple mathematics of Jesus (2012) referred to the Testimonium Flavianum (TF) since Flavius Josephus (FJ) was a Jew born in Jerusalem in 37 AD and was present at the destruction of Jerusalem in 70 AD. He is as close a historical source as we can get on the historical Jesus. The gospels of course are partial to the issue. My conclusion is that the TF is unreliable as well so that it cannot be used to say that there was a historical Jesus. The argument requires some pages plus an appendix and it leads too far to redevelop it here. The conclusion remains that it is more reasonable to assume that the gospels were created in an effort possibly in Alexandria to syncretize Jewish, Greek and Roman faiths, and that there was no historical Jesus. Of course there were numerous faith healers and preachers at that time, but to say that there was one unique individual who gave rise to the development of the gospels with their theological message, lacks evidence. Saying “there was a Jew” is somewhat meaningless. Given the argument on the TF, I stated that the argument on Tacitus was similar (on page 87). Today I had a discussion with a student of Tacitus who hasn’t seen the argument on the TF. So perhaps it might be a good exercise to develop this too. Apparently most historians accept that this proves the existence of a person called Christ and his crucifixion. Wikipedia refers to Robert van Voorst, professor of New Testament Studies at Western Theological Seminary, in Holland, Michigan. But let us deconstruct the statement. We can accept that there were maldoers & culprits [correction below] in 64 AD, since that fire and persecution are so big that these will not be easily be made up. Tacitus does not say however where he got his information on the crucifixion. The Christians will have told about it since this is their story. Thus it is possible that Tacitus relied on the Christian story to explain where their name comes from, and this is not an independent source. The Christian story mentions Pontius Pilatus (PP) and while Tacitus may have checked that there was such a figure indeed, it is not guaranteed that he located PP’s archives and found mention of said crucifixion. Writing in 116, the year 30 was 86 years in the past. It is dubious that such an independent source still existed. The crucifixion was important for the Christians but not for the Romans. But Tacitus doesn’t mention his source and thus we simply don’t know. But there may not even have been a crucifixion. The Christian story may have been constructed. In that case Tacitus must have relied on the Christian story for sure. We do know that there is no verified independent eye witness report from the years 0 – 30 AD (plus or minus) that allows to check what the gospels write or claim about Jesus. We only have such indirect texts. The main conclusion is that the evidence on Jesus has been lost in the mist of time. We cannot determine whether there was such a person or how the story came about. The evidence can be explained by assuming a preacher who inspired the gospels, but can also be explained by deliberate syncretism in for example Alexandria. Syncretism had already been done with respect to the god Serapis, so Alexandria had had some practice. We see deliberate construction as well for Apollonius. Indeed, we might try to develop a “scale of syncretism”, a tool to measure the effort to create a hero, saint or god. On that scale, Jesus may rank the highest, as the son of the creator of the universe and the saviour of all our souls. This position is another argument for a syncretic rather than a historical origin. The student I had this discussion with is dr. Anton van Hooff, a historian on antiquity and chairman of an association of atheists (“free thinkers”). He is an atheist who, because of Tacitus, still accepts the historical existence of a preacher called Christ who was crucified. When I presented him with the reasoning above, he rejected it. He excludes the syncretic explanation and refuses to consider reading The simple mathematics of Jesus for a closer look at the argument. This shows a closed mind. This is unscientic and will cause him to misinform others like his fellow “free thinkers”. So much for the “open mind” in Holland (the country). Correction December 8 2014: In the course of this discussing a book of Jona Lendering on the history of Israel en Judea in 180 BC – 70 AD, I found that I had to correct these two points: (a) There need be no proof that there were Christians involved in the Fire of Rome 64 AD. (b) Tacitus had other sources on foreign religions and might have felt no need to be specific. See that discussion for these corrections in detail. Vladimir Putin (1952) was president of Russia in 2000-2008, was premier in 2008-2012 in exchange with Dmitry Medvedev, and became president again from 2012, probably till 2020 when he will be 68 years of age. Who considers the Ukraine must also consider Putin’s thoughts about what will happen after 2020. Will he become premier again, so that he can become president again in 2024 when he turns 72 ? His fitness training will not stop him. Let us do a thought experiment. Presume that Putin has instructed the Russian state laboratories to increase the research in cloning, robots and artificial intelligence. Perhaps not yet in 2020 but possibly in 2032 when he turns 80, the old Putin can have his brain transplanted into a clone, supported by (nano-) robots and with a back-up in a supercomputer in the basement of the Kremlin, with also improved cooling for Lenin. In that way we may expect still a thousand years of Putin to come. The big moment of that transplantation is only 18 years in the future but technology develops rapidly. The Russians can also spy for new technology in the West, as for example Google apparently has a similar goal with robots and artificial intelligence. Sergey Brin is Russian by birth and he might have an emotional weak spot to help Putin. By consequence, people who think that the crisis in the Ukraine is temporary and will certainly be over when Putin’s presidency ends in 2020, better think again. When the USSR collapsed, the Russian policy makers in Moscow learned by experience that the USSR was an instable construction. At that time Putin was stationed in Dresden, Germany, and missed out on that learning experience. His goal is to restore the USSR whatever the lessons that others have learned. Some commentators are aware of this background, and then might also think that the problem will go away when Putin eventually will leave the scene. This is wishful thinking. Agreed that it still is science fiction that Putin could be transplanted into an everlasting robot-clone, but his management model of autocracy and national pride shows some endurance and may well continue for several decades. Putin’s model doesn’t allow for independent judges and a free press, and thus he cannot allow a democratic Ukraine. Kiev is historically the first Russian city and thus it cannot become a beacon for free thought. It may also be observed that the Eastern Ukraine has factories that the Russian space programme depends upon. Thus the current situation is well-explained and the only surprise was that the protesters on the Maidan Square managed to oust Putin’s puppet Yanukovich. Putin has argued that the ousting of Yanokovich was illegal since proper procedure was not followed. The Geneva Accord that calls for the retraction of illegal occupations thus also implies that Yanukovich can return. The negotiaters have been sleeping. As one option, Putin continues to destabilize the East so that he can call the presidential elections on May 25 to be illegal too. But chaos in the East will hinder his space programme too, and it may make the Russians there wary when they start realising that it is Putin who is creating their chaos. As another option, Putin allows the Ukraine to decentralize in East and West themselves, so that he can later absorb the East and then turn the West into chaos. Better options require better leadership from those who have been sleeping in Geneva. It is more useful to observe that there were Russians in Russia a thousand years ago and that in all likelihood there will still be Russians in Russia over a thousand years. Thus peace between Western Europe and Eastern Europe including Russia ought to be the policy goal. As the European Union is sold to the general public with the argument that it prevents a new war between Germany and France, why would that argument not be valid with respect to Russia ? Hence, see the earlier entry on the mindmap for the European theatre. And obviously, the process towards peace is greatly hindered by devastating unemployment all over. It is good to know that there is a solution for that too, see here. Would the world indeed require a thousand years with Putin before it sees that it better boycotts Holland to resolve the censorship of economic science with respect to the analysis on unemployment ? Financial markets await nervously – as is their modus vivendi – what will happen in the Ukraine. President Putin has some inside information about what he intends to do, and we may wonder whether he has used this inside information to take a position in Wall Street or London, via intermediates, to strike it rich when he comes into action. It is difficult to imagine that he and his inner circle will earn nothing. A weblog like this can only watch but we can at least shortly focus on nothing. Imagine Euclidean space: it is totally empty, it is the pure nothing. We don’t need a Big Bang to create Euclidean space. If we fill Euclidean space with objects then we can do so only with imaginary objects and hence it remains empty. We can imagine lines but the width of a line is zero so in a sense it doesn’t exist either. By contrast, physical space is filled with quantum fluctuations and gravity fields and so on. The seeming emptiness of the sky may inspire the idea of Euclidean space but there remains an important difference. Most philosophers have had inadequate mathematical training and struggle with their concepts. For example figures like Hegel, Heidegger and Sartre got lost in language games about “nothing”. The word “nothing” means to express that something doesn’t exist but philosophers think “when a word exists then it can only have meaning if it refers to something”. Thus if there is nothing then there still is something, e.g. nothingness – and other curious constructions like that. The wikipedia page on “nothing” is quite amusing. It were philosophers like Alfred Ayer and Ludwig Wittgenstein (not of the Tractatus but later of the Philosophical Investigations) who advised to deconstruct events and to analyse the language games played. The meaning of words is their use. Provided that the word “nothing” is used in a practical manner, to support the use of models for reality, then the philosophical nonsense collapses. Kitaro Nishida wrote the book Logic of the Place of Nothingness and the Religious Worldview. See also the Kyoto School and the Stanford philosophical page by Bret Davis. I am afraid that Nishida fell in the trap of the syllogism: “Everything that exists has a place. Nothingness exists. Thus nothingness has a place.” This is my interpretation. His own words are a curious mixture of abstraction and empty language constructs. It is mathematical parlance to say that “there is a point of intersection” but if the intersection occurs in Euclidean space then this existence is only a figure of speech. In the same way “nothingness” might perhaps have a place in some abstract way of expression. But with Euclidean space there are rather strict rules how to translate results to reality via engineering, while there are no such conventions with such philosophical texts. It is said that Nishida was interested in ways to integrate Western and Eastern ways of thought, and then it is a pity that he started with Hegel and Heidegger, whose texts tend to absolve into nothing when deconstructed. The article by Bret Davis is informative but also somewhat confusing. He holds that Buddhism is an Eastern philosophy. But its original texts are in Sanskrit and we know that this is Indo-European and thus there are common roots. Kristofer (Rik) Schipper has explained that Dao is the original Chinese philosophy while Buddhism was imported in China and Japan. Schipper also clarifies that Lao Tzu gave the original approach in Dao that is still relevant for the current majority of the population, while Kung Fu Tzu generated a version for the court of the emperor that is authoritarian and only popular in such circles. If you want to understand China, read Schipper. Dao is inherently ironic. It has elements that remind of Ayer and Wittgenstein in terms of deconstructing language games to show the futility of claims of knowledge. Dao has rituals but those are primarily provided to give people a way to express that they understand that those are mere rituals and otherwise meaningless. A Dao master can be like a skeptic Socrates who may refuse to speak or then ask teasing questions, and who performs the rituals to teach the onwatchers that he has perfected a quite meaningless ceremony. You do, to show that you don’t. In a key passage, Davis nicely states: “The latter sense of wu is expressed in chapter 40 of the Laozi (Daodejing) as follows: “The myriad things under heaven are generated from being. Being is generated from Nothingness (wu).” This unnam[e]able non-dualistic source of all being and relative non-being is also referred to as the Way (dao).” Relative is how yin and yang are required to create unity, but the whole should have come from a pure nothing. Wikipedia distinguishes Dao from Shen Dao, where the latter would be the folk belief comparable to Japanese Shinto. If I understand Schipper correctly, this would not be proper. Dao wouldn’t really differ from Shen Dao, since the shen (heavenly spirits as opposed to those from the earth) would be present in both. It is a confusion amongst Western researchers on religion that they are looking for gods who are worshipped. It is nonsense to put such gods in center place since of relevance is the path. Original Chinese philosophy / religion / way of life can best be regarded as a soup, and whoever takes a spoon or sip, will taste something different. Check at minute 45:30+ how Standing explains that there is a world crisis in low paid and insecure jobs with a new underclass that he calls “the precariat“. Standing accuses the political parties of not having a solution, and especially the leftist parties such as Labour who should be concerned on this. I tend to agree with the diagnosis on the disadvantaged and I also agree with much of his analysis: but not on the whole. The other discussant was Paul de Beer, professor at the University of Amsterdam and scientifc director of De Burcht, a research institute for the labour unions. De Beer was/is also involved in BIEN (he was at the first BIEN conference in 1986). He is a proponent of the basic income as well, though he has learned to downplay it for established welfare states so that he advises it for developing countries that don’t have an established welfare state yet. De Beer has also been involved since 1982 in the Wiardi Beckman Stichting (WBS), the “scientific bureau” of the PvdA, the Dutch Labour Party. Clearly, Standing’s accusation w.r.t. Labour should hit at De Beer. The accusation doesn’t quite hit because De Beer tends to agree on the basic income and he could wash his hands that it are the Labour politicians who don’t want it. The basic benefit is irrelevant for those with a higher productivity. You still need complex arrangements such as unemployment protection for 90% of the labour force. A person who has invested in a profession and job cannot be compensated by merely a basic benefit. The basic benefit is relevant at the subsistence level. But here issues are complex too. Simply giving people money is not necessarily the right approach. A basic benefit is said to be simpler, but what if someone makes debts and his means drop below subsistence ? You still need surveillance. What if someone has an address in various countries and collects various national basic benefits ? You still need international checks. What with cheap housekeepers from the Philippines ? They are used to a lower subsistence and the houseowner can keep a part of their new higher basic benefit in the rich countries. And so on. It is not simpler. It is different. The basis benefit does not solve unemployment fully. You still need national investment banks. You still need an Economic Supreme Court to correct for failing democracy. And so on. See DRGTPE. An alternative is to return to full employment. Allow workers to start working and then we can see from there. My advice is to first eliminate the tax void. This can be done for free and generates most of the advantages. We can see whether we want a basic benefit subsequently. See the table below. If the current situation is called Amsterdam and abolition of tax void is called Brussels, then the train ride from Amsterdam to Brussels is for free. Let the basic benefit be called Paris. The train ride from Amsterdam to Paris implies partly a train ride to Brussels. Thus the basic benefit implies the abolition of the tax void. But the final stretch to Paris will be expensive, e.g. handing out benefits to housekeepers. In 1990 when I presented my new analysis on unemployment, with the possibility to return to full employment, it was not only blocked from discussion at the Dutch Central Planning Bureau (CPB) (resolution of which is the objective of this weblog, see the about page), but it was also blocked from discussion at the WBS, and Paul de Beer was secretary of the blocking committee. De Beer does not protest against the censorship of science by the directorate of the CPB. I cannot remain a member of a party PvdA that blocks discussion of my scientific analysis and that doesn’t ask questions in parliament about censorship of science by the national government. I am a modest person and I am sure that my analysis is not all that there is, but it seems warranted that the views of the social democratic parties that are now failing could have been affected if they had had a chance to get to understand my analysis. De Beer must have been misleading Guy Standing at BIEN since 1990 since otherwise Standing would not write as he does. De Beer clearly has been misleading the Dutch branch of BIEN (“vereniging basisinkomen“). De Beer clearly misleads the students at Room for Discussion as everyone can verify that he does not mention my analysis in that video. He could have done so out of mere politeness, since I was present and you can see my shoes on the video. But he should have done merely from content. Full employment is a good alternative to a basic benefit. After he had misled the students they gratefully gave him a bottle of wine. On October 14 2005 there was a small conference organised by the Dutch Labour union FNV and De Burcht, with speakers myself, Paul de Beer and tax professor Leo Stevens (Rotterdam), see the press release. Monitors were FNV chairman Henk van der Kolk and PvdA senator Han Noten. Reactions were given by financial spokespeople for the parties in parliament, notably Stef Blok who is now a cabinet minister. This would have been an excellent place for a discussion on the advantages of abolishing the tax void. But De Beer neglected all that I said and concentrated on a discussion with Stevens. Also Stevens neglected what I said, but that is not the point here. In December 2013, the Royal Dutch Society for Political Economy (KVS) published a research booklet on labour relations, edited by De Beer. When the topic was selected in December 2012, I informed Paul that the crisis confirmed my analysis, and that I could contribute a paper on the resolution of unemployment, where I provided a link. He did not react. See the result: a misleading document (in Dutch). Whenever I meet people who are in favour of a basic benefit and I present the counterarguments, it turns out that they are not willing to reconsider their position. Apparently there are strong elements of ideology here. They rather advocate a basic benefit while it will not be introduced quickly, and while I have shown an alternative that will work and has a chance of adoption: full employment. These ideologues do not protest against the censorship of science either. This may also have played some role at the CPB in 1990. It appeared later that director Gerrit Zalm was in favour of a basic income, as the CPB study Scanning the Future (1992) contains a scenario with a basic benefit. Zalm follows Milton Friedman here. The basic benefit would be at subsistence (as low as possible) and the remainder of the welfare state could be abolished. See Scanning the Future p205 for the “balanced growth” scenario, while this scenario in Nederland in Drievoud (1992) p24 has an explicit negative income tax. When he later became minister of Finance, Zalm replaced tax exemption by a tax credit, with the political idea in mind that this could be developed into a basic benefit. However, he used a deliberate lie to get this change accepted, see the paper Economics as victim between lawyers and mathematics: An explanation for the tax credit, Bulgarian potential fraud, European unemployment and the economic crisis (2013). Thus, basic-benefit-proponents claim to advance the cause for the disadvantaged, but in fact they block an analysis that would really help those. This concerns one billion people on the planet. Do we see pure evil here or not ? Don’t censor science – is that so difficult to understand ? 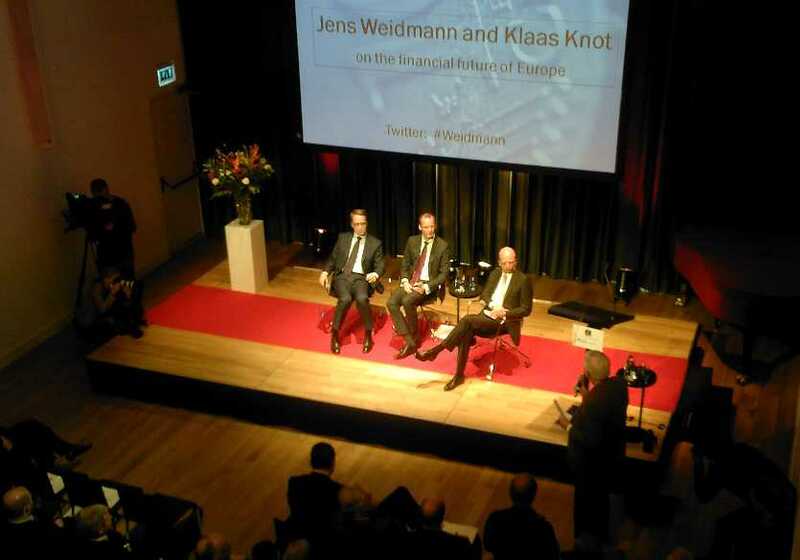 The president of the Bundesbank Jens Weidmann came to Amsterdam on invitation by the president of the Dutch Central Bank Klaas Knot. The German Institute (DIA) of the University of Amsterdam organised a small conference where they presented their views and answered some questions from the audience. We can find Weidmann’s speech at the Bundesbank website. A key point is that the ECB statute is targetted at controlling inflation. In the onslaught of the crisis since 2007 the ECB got an additional role in maintaining financial stability and preventing collapse, like with the supervision of the European Banking System (see the alphabet soup), but the Bundesbank considers it advisable that the ECB returns to its original role for stable money. A new Treaty is required, with a rejuvenated ECB and a new authority for monitoring the financial sector. Thus, in a curious way, Weidmann suggested that he was irrelevant to talk to. Just let the ECB / Bundesbank manage inflation, forget about their existence, and talk to other people when you want to discuss financial stability. Having said this, didn’t stop Weidmann however in making his comments on monetary and financial stability. A key point is that Basel III would need to be revised. Government debt is handled in the regulatory framework as risk free while the markets assign risks. See this report by Bloomberg 2011, when it was already an old issue. This weblog reported in 2012 about the visit of professor Bofinger to Amsterdam, who rejected that government debt could default since that would be some kind of bailout. Apparently there is little enthousiasm amongst regulators for amending Basel III, in particular amongst most countries other than Germany and Holland who would lose their risk free status. Weidmann turned on the screws however. He mentioned France as a “core country” that fails in its structural reforms and ought to suffer the consequences. In my impression Basel, Bofinger en Weidmann are stuck in a logical conundrum. I refer to my earlier paper for a solution approach Conditions for turning the ex ante risk premium into an ex post redemption for EU government debt. Naturally the juridical status of the OMT came up, as it also was mentioned in an earlier weblog entry here. A professor from Leiden asked Weidmann whether he hadn’t put the authority of both the Bundesbank and the Bundesverfassungsgericht at stake, by voting against the OMT and publicly speaking out against it. “We are not lemmings,” Weidmann answered. In terms of their fear for inflation Germans actually are like lemmings, but obviously he has a good point that Germany shouldn’t be asked to pay for what other nations squander, and obviously OMT is a curious construct while there are much better approaches, see my Economic Plan for Europe and paper Money as gold versus money as water. The joker of the afternoon came in the person of former EU commissioner Frits Bolkestein. He wondered whether Southern Europe should not take a vacation from the Euro, return to their original currencies, re-establish competitiveness, get some help in doing so, and then apply for the Euro again. He glossed over a question like how to handle the debt that is denominated in Euro’s. Weidmann and Knot remained polite and gave the obvious answers. A monetary union exists by stability and not a revolving door. Financial markets would sniff out potential departures and the speculations would force them. Bolkestein’s idyllic vacation is a recipe for economic chaos. PM. A Dutch report by DIA is here. The text by Klaas Knot is here. Here is an interview with Weidmann on Dutch national television – in German with Dutch titles. The closing statement by Weidmann is that we can already see the light at the end of the tunnel. In my analysis he can only point to a small air vent that also leaks some light. We will not suffocate before we die from starvation.